You can quickly create claims for procedures that are not attached to insurance claims. Also, you can edit any unattached procedure before you create a claim for that procedure. Tip: You can create a claim for a patient's procedures while performing a patient checkout. On the Home menu, under Insurance, click (or tap) Create Claims. The Create Claims page opens. To create claims for all procedures for all patients listed, leave the All check box at the top of the page selected. To create claims for specific procedures for a specific patient, clear the All check box at the top of the page, and then, under the appropriate patient's name, select the check boxes of the procedures to include or the All check box to include all procedures. Note: For an unattached procedure to appear on the Create Claims page, the service date of that procedure must fall within the coverage dates of a patient's insurance plan, and that procedure must be marked as billable to insurance. To edit a procedure before creating a claim for it, click (or tap) the procedure code link, make the necessary changes, and then click (or tap) Save. To hide the procedures and show only the patient names, click (or tap) Collapse All. To hide or show the procedures for a specific patient, click (or tap) the header with that patient's name. For the selected procedures, the associated diagnoses appear. You can have up to four ICD-10 codes per claim. If you have more than four, either remove ICD-10 codes from the claim (by clicking, or tapping, on the coresponding codes), or split the procedures between separate claims (clear the check boxes of the procedures that you do not want on this claim, so you can create one or more additional claims for those procedures). Note: Removing ICD-10 codes from a claim does not affect the corresponding procedures. All diagnoses remain attached to their corresponding procedures as currently posted in the patient's ledger and progress notes. If there are two, three, or four ICD-10 codes, select the one that you want to be the primary diagnosis. Select the Place of Service for the claims that will be created for the selected procedures. Note: You can change the place of service for a claim later if needed. Click (or tap) Create Claims. 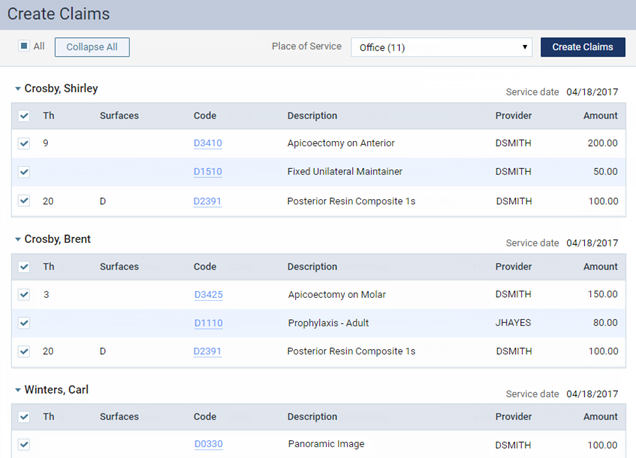 For each patient with procedures selected, separate claims are created for the service dates of the selected procedures. Three claims will be created (one for procedures 1 - 2, one for procedures 3 - 5, and one for procedure 6). How do you CLOSE a claim?